Identification: This is a large species with numerous slender cerata that can be coiled over the notum or "flared" when disturbed. Cerata extending in front of the head serve as feelers. 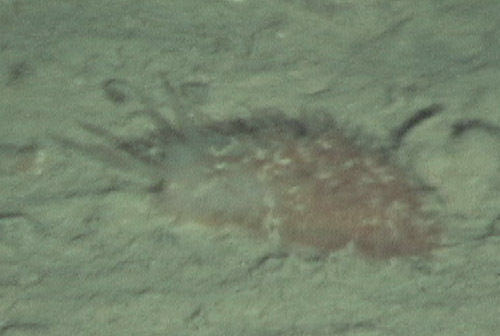 Natural history: Madrella sp #1 has been photographed from HURL submersibles at a depth of 450 m (1476 ft). Taxonomic notes: It was first recorded in Hawaii by the Undersea Research Laboratory (HURL) during Pisces submersible dive # P4-85, principal investigator John Wiltshire, Sept 25, 2003. There's some uncertainty in placing it in this genus and family. Photo: HURL-NOAA archives, John Wiltshire (PI): 450 m (1476 ft); Oahu; Sept. 25, 2003.